The same effort spent looking for excuses to quit could instead be used to keep reminding yourself of your reasons to keep going. Don’t fight against your own best interests. Instead, let your thoughts support your ambitions. If you’re going to put forth the mental effort to justify and rationalize a course of action, then by all means make the case for your own success and achievement. Keep on convincing yourself of the value of your goals, and you’ll keep on doing what is necessary to reach them. Deciding to persevere is no more difficult than deciding to quit. And when you decide to keep pressing forward, the rewards are infinitely greater than if you had decided to give up. Be your own biggest supporter. Use the strength of your thoughts to continually encourage your own positive, productive actions. 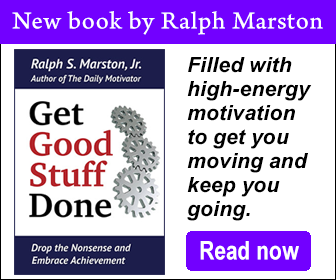 Copyright ©2000 Ralph S. Marston, Jr. All Rights Reserved. The Daily Motivator is provided for your personal, non-commercial use only. Other than personal sharing, please do not re-distribute without permission.